Snyder's of Hanover Pretzel Sticks. Pretzels are a quick, easy, enjoyable fat free snack. 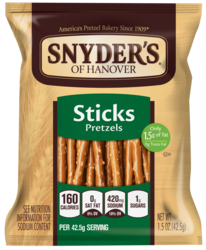 Our Snyder's of Hanover Pretzel Sticks are the most popular pretzel we have found. Enjoy! (Perfect Snack Size) of delicious Snyder's of Hanover pretzels.